Only around five weeks will separate Endeavour’s return home from her STS-126 mission, and when Discovery is due to rollover to the Vehicle Assembly Building (VAB) ahead of STS-119. Discovery’s upcoming milestones are part of a realigned plan for the 2009 missions. However, STS-119’s launch date advancement has been disapproved by shuttle managers. The S6 element of the Integrated Truss Structure will be the primary (and largest) component of Discovery’s 15A payload package, which also includes the MAUI, SEITE, and SIMPLEX payloads. Discovery has almost completed processing for the 15 day mission, following STS-124. Her crew arrived late last week to check on the progress being made on the orbiter during the Crew Equipment Interface Test (CEIT) milestone – ahead of final rollover preps, aft closeout work, and Payload Bay closeout work. With the Christmas/New Year holiday splitting the STS-119 flow, managers have planned out a schedule that will now result in Discovery heading to the VAB on January 7. “Due to the rollover date being changed to 1/7/2009 this is the plan for the holiday period and for Preps starting January 2nd,” noted an overview on L2. “STS-119 will continue to close out the orbiter and be ready to go to Weight and C/G (Center of Gravity) on December the 5th. “Overall Orbiter Configuration thru the Holiday Period: Forward and Aft 570 Jack Set. T-O’s remain hooked up. Purge air will remain hooked up and supporting Temperature in the High Bay must be able to maintain thruster temps with 60F environment with purge air. OMS temperature on thrusters must remain above 45F degree or LPS and Orbiter Power for heaters must be applied. “Perform OMS System configuration November 5th prior to Christmas Holidays Vent doors to be positioned for Rollover Post V1007 December 5th and prior to Final Power Down. Final Orbiter power to be December the 5th. Tile Protective Covers to remain in place until January 5th. “Payload Bay Doors closed December 4th and Strong backs removed December 5th. Wings closed for flight. Elevons closed out and on chain falls until January 2nd to prevent obstructions. RCC Covers to remain in Place until January 2nd. Tire (pressure) top off for Flight will begin on January 2nd. “AFT 50-1 and 50-2 Doors installed by December 3rd and Interior AFT ready to support Rollover. OMS purges to be disconnected on January 2nd 2009 for Rollover. Disconnect T-O’s starting January 2nd to be ready to support Weight and C/G on January 5th. Such has been Discovery’s smooth processing flow, she would have been able to support the proposed launch date advancement to January. However, this has been officially disapproved due to the stress it would have caused on “Crew Loading” – which represents the crew’s training schedule. Feb. 12 remains the launch date target. “Training Landscape for a Launch Date of 1/20/09: Training Duration: 11/17/08 – 1/14/09 (Crew in quarantine on 1/13/09). Represents an acceleration of 17 Business Days. 6.6 Weeks available training time in calendar until Launch (if Holidays and Leave preserved),” noted one of several presentations on the proposal – available on L2. Three scenarios were considered in the resulting assessment, all of which would have led to either the removal of crew leave over Thanksgiving and Christmas, the removal of training content, or a combination of the two. Ultimately, the reduction in crew training, and additional strain on the training schedule over the upcoming crew leave was deemed to be a risk to safety – which led to its expected shelving. Following STS-119, NASA hopes to finally launch Atlantis on the flagship mission to service the Hubble Space Telescope. This mission has been delayed due to a hardware failure on orbit, and once again via issues with the ground testing of its replacement. However, engineers are close – to the point their findings may be sent to management this coming week – to confirming they are ready to support the May launch opportunity. The latest manifest – available on L2 – shows STS-125 with a NET (No Earlier Than) May 12 launch date – pending timely delivery of the replacement hardware to the Kennedy Space Center (KSC). Also confirmed in the latest manifest document are the downstream changes to the 2009 flights, which involves an orbiter swap and delay to two missions. The FAWG manifest – which is used for processing milestone planning – confirms the changing of orbiters for STS-128/17A, which is now set to launch on August 6 via Discovery (OV-103). Originally, STS-128 was due to launch on Atlantis at the end of July. The mission was recently baselined as a 11 day, two EVA flight to the ISS. However, this will now change, with another baseline soon to follow. It will also include the first flight of the OI-34 Flight Software, and will be the last scheduled ISS crew rotation to be undertaken by the Space Shuttle Program (SSP). The primary payload will be the Multi-Purpose Logistics Module (MPLM) Leonardo and the Lightweight Multi-Purpose Experiment Support Structure Carrier (LMC). As part of the swap, Atlantis now gains STS-129/ULF3, which will launch on November 12, moving from its previous slot of October 15. This mission was previously allocated to Discovery, but is now likely to move to Atlantis – following the reassignment of STS-128. STS-129 will deliver the first two of five Express Logistics Carriers (ELCs) to the ISS, and is currently due to return Canadian Space Agency astronaut – and ISS Expedition 20 Flight Engineer-4 – Robert Thirsk to Earth. This mission will also be re-baselined. 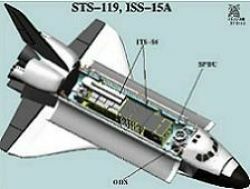 STS-130 – currently assigned to Endeavour – is now likely to be the opening mission of 2010, which will result in the delivery of Node 3 to the ISS. The payload is due to arrive at KSC’s Shuttle Landing Facility (SLF) on February 13, 2009. STS-131 – a logistics run to the ISS – will then follow, ahead of two CLF (Contingency Logistic Flight) missions (STS-132, STS-133) which had been scheduled for mid April and late May respectively. These missions were recently covered in the approval of latest Senate Bill. Efforts behind the scenes are continuing on evaluations into flying shuttle to 2012. Assessments have proved the viability from a hardware standpoint, with a final decision – notably based on additional monies for the space program – due next year. At the same time, the Constellation Program (CxP) have finalized three options for advancing their schedule, as part of the effort to close the gap. Notes from the meetings (L2) will be part of a forthcoming article.